Jaclyn has extensive training in ballet, studying at Repertory Dance Theatre, Pennsylvania Academy of Ballet, Kirov Academy of Ballet in D.C., and Nutmeg Conservatory for the Arts, in CT. Jaclyn spent several years dancing with Dance Theatre of Pennsylvania. As a student, Jaclyn was one of six students selected to study with Vadim Pisarev and Inna Dorofeeva with the Donetsk Ballet of Ukraine. Jaclyn has performed in a host of classical ballets including, “The Nutcracker”, “Cinderella”, “Coppelia”, “Sleeping Beauty”,”Dracula”, “A Midsummer Nights Dream”, along with excerpts, and variations from “Swan Lake”, and “La Bayadere”. She also has performed in various other works of classical and contemporary choreographers. 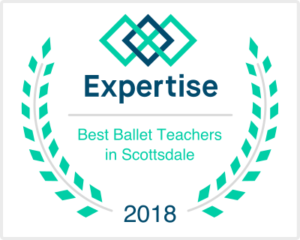 Jaclyn’s teaching experience includes, Budzynski Studios of Ballet, under the direction of Marilyn Budzynski in Pennsylvania, Scottsdale School of Ballet, under the direction of Donald and Sibylle Dadey in Scottsdale Arizona and Master Ballet Academy, under the direction of Slawomir and Irena Wozniak in Scottsdale Arizona. Jaclyn has been working with the Ice Den’s figure skaters since 2010. Jaclyn is thrilled to share her passion for ballet with all of her students. She hopes that the figure skaters will develop an appreciation for the art of ballet, while further developing the artistic presentation, form, and quality of their skating. “Ballet for Figure Skaters” started with one 7-year old competitive figure skater in 2010. A Mom and her Daughter came to a local Ballet School in Scottsdale, AZ, where I was teaching a ballet class for 6-7 year olds. The Mom of the Figure Skater told me that she was sent to the studio by their coach because her Daughter was in need of ballet. I was instantly intrigued, because I had been a fan of figure skating for as long as I could remember. After a few weeks of classes with this young figure skater, we did a few private lessons where we looked at her skating programs specifically. It didn’t take long before her coach noticed a difference. Then…Word Spread!!! It wasn’t long before I had a skater or two from another coach. A month or so later, I received a phone call from the head of the Figure Skating Department at the Scottsdale Ice Den asking if I would be interested in becoming the “Resident Ballet Coach”? I was thrilled, and of course said yes! That was the start of the “Ballet for Figure Skaters” Program. It is my dream to see these Figure Skaters look like Dancers on the ice. We have an amazing, supportive team of coaches here at the Ice Den; the professionalism, demand, and opportunities offered are incredible. The Figure Skaters have everything at their fingertips to succeed in their sport. The coaches have been a huge help in supporting ballet for their skaters. I hope to inspire my students, so that they develop a passion and respect for the art of ballet, as well as improving the overall quality of their skating. Elena has been working in the dance and fitness industry for 30 years. She was part of the Jaques D’Amboise Youth Dance Program, in New York. Elena had the privilege of dancing in a tribute to George Balanchine at Lincoln Center. She also danced with the Oakland Ballet. Moving into the fitness industry in the late 80’s she was an aerobics instructor and personal trainer. Later competing as a national fitness competitor, she was runner-up Miss Fitness USA and National Fitness finalist. In 1997, Elena began her classical Pilates training in New York under 1st generation master teacher, Romana Kryzanowska and finished her apprenticeship and certification in 2001. Elena has been teaching independently ever since. Elena’s exercise philosophy is form, function and flexibility first. She has a passion to continue Romana’s legacy of teaching authentic, classical Pilates to all of her clients, and loves seeing the wonderful results that come with their training. Leanne started her dance training at the age of 7 at Nina Marlow School of Ballet. By the time she was 8, she was training at Master Ballet Academy, with Slawomir and Irena Wozniak, concentrating on ballet. During the following eight years she won numerous awards in both national and international competitions, with both ballet and contemporary solos. She has danced professionally as a guest soloist a few times, and traveled to different destinations to perform and compete (New York City, Orlando, Florida, San Diego and Los Angeles, California, Germany, China, Romania among other destinations). While a student at Paradise Valley High School’s Elite program under the direction of Mary Gamboa, she has been training with choreographers Brigid Benson, Jose Soto, Ricky Maalouf, Mikayla Harp, Regina Owens, to name a few. She also has training, college credits and experience as a contemporary choreographer.